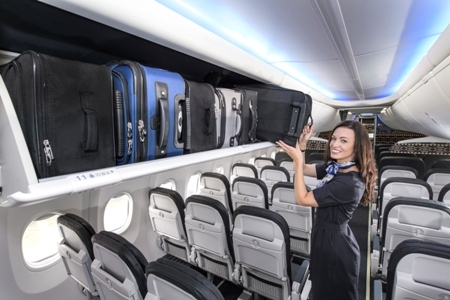 Boeing and hometown partner Alaska Airlines celebrated the first 737 featuring Boeing’s new Space Bins, which increase the room for carry-on baggage by 48 percent. Alaska is the launch customer of Space Bins. Alaska will take delivery of 34 Next-Generation 737s and one 737 MAX in the next two years and will also begin retrofitting 34 aircraft with the Boeing Sky Interior, primarily 737-900ERs (Extended Range), in 2016. Each Space Bin stows six bags, two more than the current pivot bins installed on Next-Generation 737s with the Boeing Sky Interior. That’s based on a standard size carry-on bag measuring 9 in x 14 in x 22 in (23 cm x 36 cm x 56 cm). When open, the bottom edge of a Space Bin hangs about 2 inches (5 centimetres) lower, so travellers can lift their carry-on bags more easily. The deeper bins allow more bags to be stowed and increase visibility into the back of the bins. Alaska Airlines also reports that the Space Bins, designed without a flight attendant bin assist mechanism, are easier to close. Alaska Airlines is installing Space Bins on all its 737-900ERs and 737 MAX aircraft currently on order and by 2017 will have 69 airplanes, or 46 percent of its passenger fleet, outfitted with Space Bins. Boeing’s Space Bins are available as an optional feature on in-production Next-Generation 737s and 737 MAXs. Space Bins are also available for retrofit on in-service Next-Generation 737s.